უკანასკნელი ათი წლის მანძილზე, ქალაქი სტამბული აწყდება ურბანული სივრცეების გაშმაგებულ ტრასფორმაციას სახელმწიფოს მხრიდან, მუნიციპალიტეტის ინიციატივით და გლობალური კერძო ინვესტიციებით. უფრო მეტიც, ყოველწლიურად ფართოვდებიან სახელოვნებო ინსტიტუციები და კერძო მუზეუმები; და დამოუკიდებელი სივრცეები კარგავენ თავიანთ სივრცეებს. და მაინც, ესეთ უზარმაზარ ქალაქში არ არის საკმარისი დამოუკიდებელი სივრცეები, ინსტიტუციები დამოუკიდებელი ხელოვანებისთვის, ჯგუფებისთვის და კურატორებისთვის. რა გლობალური და ლოკალური ზეგავლენა აქვს სტამბულის საერთაშორისო ბიენალეს ქალაქში სახელოვნებო სივრცეებზე? ვინ ნახულობს სარგებელს ასეთი ინტენსიური ინტიტუციონალიზმით? რა სისულელე იყო “European Cultural Capital Project of Istanbul” (სტამბულის ევროპული კულტურული დედაქალაქის პროექტი) 2010 წელს? როგორც ორგანო, ძალა, რას გულისხმობს სახელოვნებო ინსტიტუცია/სივრცე ურბანულ სივრცეში? პრეზენტაცია შეეხება უკანასკნელი ათი წლის მანძილზე სტამბულის განვითარებას კულტურის სფეროში, ურბანულ ტრანსფორმაციასა და ცვლილებებთან მიმართებაში. პრეზენტაცია იქნება პროექცია და ქალაქ თბილისის კონტექსტში დასვამს შეკითხვას: სჭირდება თუ არა ქალაქს ბიენალე? როგორი უნდა იყოს მუნიციპალიტეტის კულტურული პოლიტიკა? როგორი უნდა იყოს ხელოვანების მიერ ინიცირებული დამოუკიდებელი სივრცეების მომავალი? ავირჩევთ თუ არა ხელოვნების და კულტურის ნორმალიზაციის გზას, რომელსაც ახალი ინსტიტუციები ჩაუდგებიან სათავეში თუ არსებობს რაიმე ალტერნატივა? In last ten years, the city of Istanbul is facing a rabid transformation of urban spaces by state-led, municipality initiations and global private investments. Moreover, art institutions and private museums are expanding each year; and independent spaces loose their spaces. Still, there are not enough independent spaces, institutions for independent artists, groups and curators among this expansion in such a huge city. What is the global and local affects of international Istanbul biennial on the art spaces in the city? Who benefits in such intense of institutionalism? What was the crap of “European Cultural Capital Project of Istanbul” in 2010? As an agency, what does an art institution/space means in urban space? 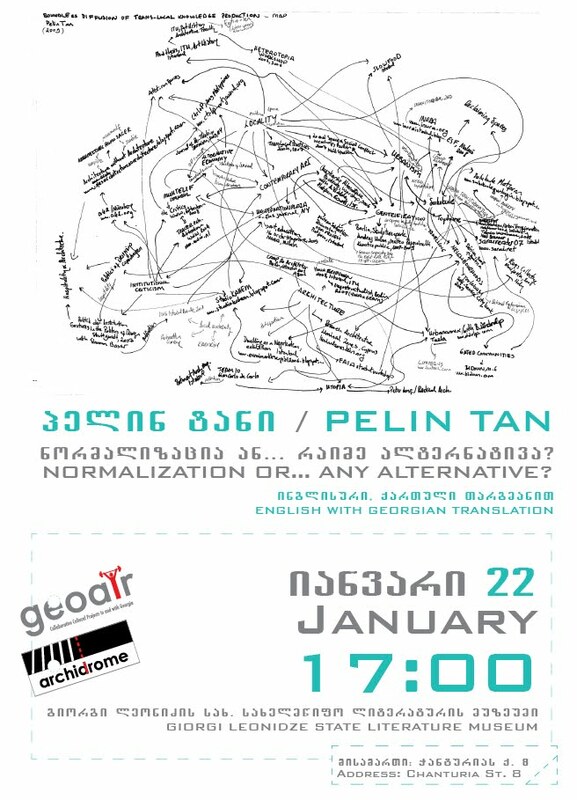 The presentation will be about the last ten years developments in the cultural field of Istanbul in relation to urban transformation and changes.The presentations will be a projection and will ask questions for the city of Tbilisi: Does a city need a biennial? What should be the cultural policy of the municipality? What should be the future of independent spaces of artist initiations? 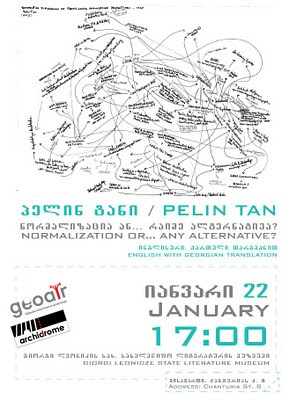 Would we choose to go into normalization of art and culture led by new institutions or is there any alternative? პელინ ტანი არის სოციოლოგი და ხელოვნებათმცოდნე (დაიბადა 1974 წ.) 2001-2010 წლებში იგი იყო მკვლევარი სტამბულის ტექნიკურ უნივერსიტეტში, სოციოლოგიური მეცნიერების ინსტიტუტში. 2011 წელს პელინ ტანი მიწვეულია მასაჩუსეტის ტექნოლოგიების ინსტიტუტში, არქიტექტურის და დაგეგმარების სკოლაში, არქიტექტურის განყოფილების ACT (ხელოვნება, კულტურა და ტექნოლოგიები) პროგრამის მკვლევარ თანამშრომელად. მანამდე იგი იყო ნიურნბერგის სამხატვრო აკადემიაში არქიტექტურის და ურბანული კვლევების სამაგისტრო პროგრამაში მოწვეული პროფესორი (2008); ასევე მოწვეული ლექტორი ბერლინის ტექნიკური უნივერსიტეტის, ხელოვნების ისტორიის ფაკულტეტზე (2006-2007), და ტრიერის უნივერსიტეტში (2004). ტანი ამჟამად მუშაობს პუბლიკაციაზე “უპირობო (უსაზღვრო) მასპინძლობა და არქიტექტურა” (გამოქვეყნდება) და არის თანარედაქტორი (სეზგინ ბოინიკთან ერთად) პუბლიკაციისა დისკუსია საზოგადოებრივ სივრცეზე თანამედროვე ხელოვნებაში (Güncel Sanatta Kamusal Alan Tartışmaları (2007). იგი ასევე არის თანამედროვე ხელოვნების ჟურნალის Muhtelif-ის რედაქტორი და ავტორი სტატიებისა ისეთი გამოცემებისთვის, როგორებიცაა: გახდე სტამბული. 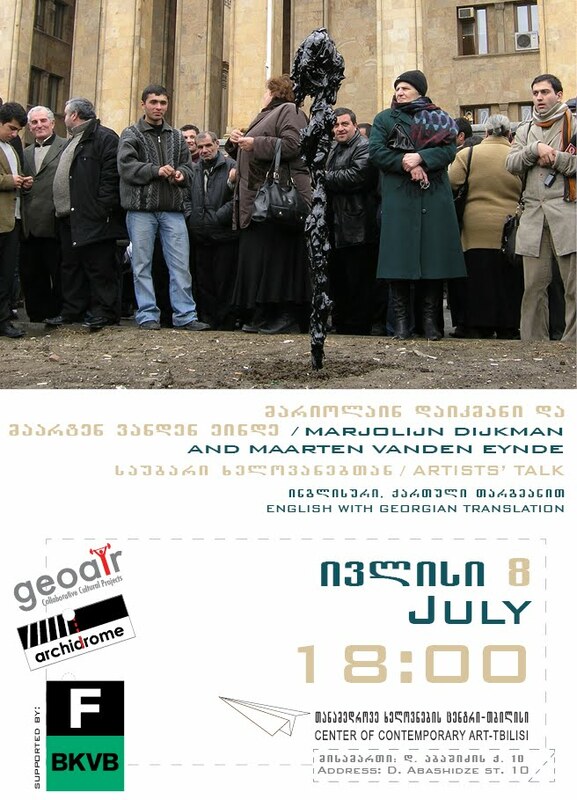 ენციკლოპედია (Becoming Istanbul, An Encyclopedia (2008); როდესაც ნივთები ჩრდილს არ ტოვებენ (ბერლინის მე-5 ბიენალეს კატალოგი) (When Things Cast No Shadow (2008); გადატვირთული მეგასტრუქტურა (Megastructure Reloaded (2008) და თანამედროვე ხელოვნება თურქეთში: 1986-2006 (Contemporary Art In Turkey: 1986–2006 (2007). პელინ ტანი არის სტამბულში DEPO-ს კურატორული საკონსულტაციო საბჭოს წევრი. იგი იყო კურატორი კვლევებზე დაფუძნებული მრავალი პროექტის და გამოფენის, რომლებიც თანამედროვე ხელოვნებისთვის ისეთ მნიშვნელოვან თემებს განიხილავს როგორებიცაა: ურბანული ადგილმდებარეობა და სოციალური კონფლიქტები; ალტერნატიული საგანმანათებლო ფორმატები; ინსტიტუციონალური კრიტიკა; სოციალური დამატებითი ღირებულება და გავრცელება. 2011 წელს პელინ ტანი იმუშავებს აზიაში არსებულ სახელოვნებო სივრცეების და შრომის კვლევით პროექტზე; იგი არის რედაქტორი სპეციალური გამოცემისა, მიძღვნილი სოციალური დამატებითი ღირებულების თემას; დამოუკიდებელი პედაგოგი და კურატირებას უწევს კნუტ ასდამის პერსონალურ გამოფენას (ივნისი, DEPO). პელინ ტანი დაფუძნებულია სტამბულში, მუშაობს ტრანსლოკალურად. Pelin Tan is a sociologist and art historian. She was a researcher at the Institute of Social Sciences, Istanbul Technical University, Istanbul (2001-2010). Tan is a research fellow in Spring 2011 at the ACT (Art, Culture, and Technology) program of the Department of Architecture – School of Architecture and Planning, Massachusetts Institute of Technology. Previously she was a guest professor at the Academy of Fine Arts, Architecture and Urban Research MA Program, Nuremberg (2008); and guest lecturer at the History of Art Departments at the Technical University, Berlin (2006–2007) and Trier University, Trier (2004). Tan is currently working on the publication Unconditional Hospitality and Architecture (forthcoming) and co-edited (with Sezgin Boynik) the publication Güncel Sanatta Kamusal Alan Tartışmaları [Public Space Discussion in Contemporary Art] (2007). She is also editor of Muhtelif contemporary art magazine, and has contributed to numerous publications including: Becoming Istanbul, An Encyclopedia (2008); When Things Cast No Shadow (catalog, 5th Berlin Biennale) (2008); Megastructure Reloaded (2008); and Contemporary Art In Turkey: 1986–2006 (2007). She is a member of the curatioral advisory board of DEPO Istanbul. Tan curated several research-based projects and exhibitions that are consisting of issues in contemporary art: Urban localities and social conflict, Alternative education formats, Institutional criticism, Social surplus value and dissemination. For 2011, Tan is working on a research project of artist run-spaces in Asia and labor; editing a special issue on social surplus, freelance teaching and curating Knut Asdam Solo show (June, DEPO). Pelin Tan is based in Istanbul, works trans-locally.